can be seen along the coast on migration, especially after storms. 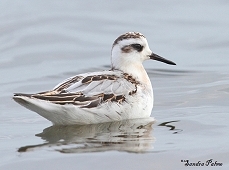 grey phalarope at Prinsted in West Sussex in September 2011 and one on a children's paddling pool in Hove, East Sussex in January 2014. 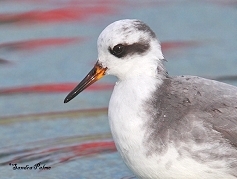 Both birds were virtually tame - not unusual for phalaropes that have probably never met humans before. I wish bird watching could always be like this! Please click on the thumbnails to see more photos of the two birds.